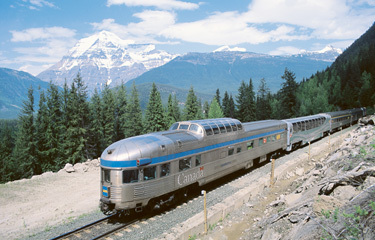 Journey across Canada by train. A young lady sat in a train. At the next stop a loud and grumpy old lady came and sat by her. She squeezed into the seat and bumped her with her numerous bags. The person sitting on the other side of the young lady got upset, asked her why she did not speak up and say something. If each one of us realized that our time here is so short; that to darken it with quarrels, futile arguments, not forgiving others, discontentment and a fault finding attitude would be a waste of time and energy. Did someone break your heart? Be calm, the journey is so short. Did someone betray, bully, cheat or humiliate you? Be calm, forgive, the journey is so short. Whatever troubles anyone brings us, let us remember that our journey together is so short. No one knows the duration of this journey. No one knows when their stop will come. Our journey together is so short. Let us cherish friends and family. Let us be respectful, kind and forgiving to each other. Let us be filled with gratitude and gladness. If I have ever hurt you, I ask for your forgiveness. If you have ever hurt me, you already have my forgiveness. After all, our journey together is so short!